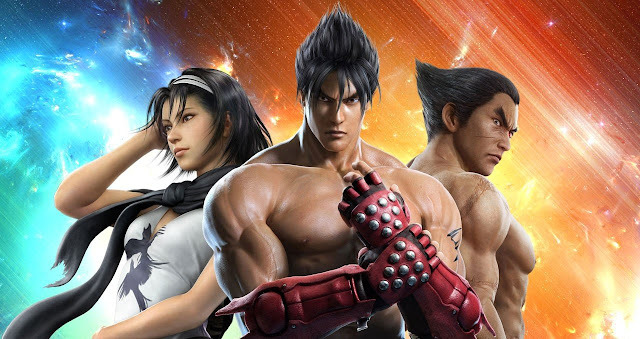 Heres the full movelist for Tekken Revolution submitted by Cat. Note: To find a specific character quickly, you can use CTRL + F on your keyboard. changed, I've notated that move in CAPITAL LETTERS! 1,b,3 - Roll out, roll backwards, rising low kick. to perform a Handspring Kickup into a Flying Cross Chop. King will recover in BT position after a Rising Kickup. d/f+2, 1, 1,2, f+2,3,3 -=- 7 Hits -=- 42 pts. u/f+4,4, f+2, f+1,1, d+4,1+2 -=- 7 Hits -=- 52 pts. f,f+1+2, d+1, WS+1,2, f+1, f+2,3,3 -=- 9 Hits -=- 52 pts. b+3+4, f+2, f+4,1,4 -=- 5 Hits -=- 52 pts. WS+2,3+4, 1,2,1,3+4 -=- 6 Hits -=- 54 pts. f+2, u/f+3, d/f+1,2, 2,1,1+2 -=- 7 Hits -=- 57 pts. d/f+2, u/f+3, b+2,1,3, f+1+2 -=- 7 Hits -=- 54 pts. 1+2, d/b+4,3, 2,1,1+2 -=- 6 Hits -=- 56 pts. FC,d/f,d,d/f+1+2, u/f+3, 2,1, 2,1,1+2 -=- 7 Hits -=- 50 pts. 3~4, WS+4, f+2 -=- 3 Hits -=- 42 pts. WS+2,b+2, b+2,1,2 -=- 5 Hits -=- 71 pts. d/f+3, u/f+3, d/b+2, f+2,1,4 -=- 6 Hits -=- 52 pts. f,b+2, f+1+2, f+1, f,f+2 -=- 4 Hits -=- 50 pts. WS+1, b+2,1, f+1, f+4,1 -=- 6 Hits -=- 50 pts. u/f+4, d/b+2, d/b+2, 3,3,4 -=- 6 Hits -=- 57 pts. d/f+2, d/f+1, d/f+1,2,1,2 -=- 7 Hits -=- 41 pts. WS+1, 1, b+3,2,2 -=- 5 Hits -=- 48 pts. f,f+2, u+1+2, u+1+2, b+3,2,2 -=- 6 Hits -=- 64 pts. d/f,d/f+2+4, U/F,4, b+3,2,2 -=- 5 Hits -=- 51 pts. f,f+1+2, d/f+1,2,1,2 -=- 6 Hits -=- 44 pts. f,N,d,d/f+2, 1, 1,2, d/f+1,2 -=- 6 Hits -=- 45 pts. WS+1,2, 3,1,4, d/f+1,2 -=- 7 Hits -=- 52 pts. f,f+3, f,f, 3,1,4, d/b+2 -=- 5 Hits -=- 51 pts. WS+2, 1,2,4,3 -=- 5 Hits -=- 50 pts. Devil SS+2, f,N,d,d/f+1~U/F -=- 3 Hits -=- 61 pts. u/f+4, 2,1, f+2,2,1, b+3 -=- 7 Hits -=- 53 pts. WS+1+2, 1,2, f+2,2,2 -=- 6 Hits -=- 48 pts. FC,d/f+1, WS+4, d+3+4,2 -=- 4 Hits -=- 45 pts. FC,d/f+2, d/f+4,3, f+1,2, f+2+4 -=- 6 Hits -=- 56 pts. u/f+1+2, d/f+4,3, f+1, b+1,4 -=- 6 Hits -=- 55 pts. u/f+4, f+3, DE 2, d/b+2,1, f+2,1~F, SE 1 -=- 7 Hits -=- 58 pts. WS+1~F, SE 3, 2, f+4,1,2, d/b+2~F, SE 1 -=- 8 Hits -=- 58 pts. f,b+2,1, f+3, DE 2, d/b+2,1, f+2,1~F, SE 1 -=- 8 Hits -=- 58 pts. f+1+2, d/b+2, d/b+2,1, f+2,1~F, SE 1 -=- 7 Hits -=- 63 pts. u/f+3, FC+2, WS+2~F, SE 1 -=- 5 Hits -=- 49 pts. d/f+2, f+2, b+1,4~d/f~u/f+1, b+2,1+2 -=- 7 Hits -=- 51 pts. BOK 2, U/F,4, f+1, b+2,1+2 -=- 5 Hits -=- 52 pts. u/f+4, 4, b+1,4~d/f~u/f+1, b+2,1+2 -=- 7 Hits -=- 54 pts. f,f+4, 4, b+1,4~d/f~u/f+1, f+1+2 -=- 6 Hits -=- 55 pts. WS+2, 3,2, f+1, f+2,2 -=- 6 Hits -=- 45 pts. d/f+3+4, BT d+1, WS+2, d+1,2,4 -=- 6 Hits -=- 45 pts. WS+2, u/f+3+4, 1, 1,2, u/f+3+4,3+4 -=- 7 Hits -=- 53 pts. u/f+3, d/f+1, d/f+1, 1, 1,2,4 -=- 7 Hits -=- 43 pts. SS+3, f+3+4 -=- 3 Hits -=- 40 pts. d/f+2, b+2,3,4, f,f+2,1,3 -=- 7 Hits -=- 48 pts. WS+2, 4, b+2,3,4 -=- 5 Hits -=- 46 pts. f,f+3+4, 1,2,3, b+4,3 -=- 6 Hits -=- 35 pts. U/F+4,3, b+2, f,f+2,1,3 -=- 6 Hits -=- 58 pts. u/f+4, 4,u+3, f,f+4,3 -=- 5 Hits -=- 42 pts. u/f+4, 1,2, QCF+2 -=- 4 Hits -=- 39 pts. d/f+2, 1, QCB+3,2,1 -=- 5 Hits -=- 42 pts. WS+2, 1,2, d+4,2,1+2 -=- 6 Hits -=- 54 pts. QCF+1, d/f+1, f+2,3,1 -=- 5 Hits -=- 51 pts. QCB+1+2, u/f+3, d+4,2,1+2 -=- 5 Hits -=- 58 pts. f+3,2, 1, d/f+1,2,1~b, FLI 1,2 -=- 6 Hits -=- 43 pts. u/f+4, 1, 1, 1,2,1,2 -=- 7 Hits -=- 45 pts. u/f+2, d/f+1,2,1~b, (FLI) 1,1,,2 -=- 6 Hits -=- 50 pts. b+3,2, d/f+1, 1,2,1,d+2 -=- 6 Hits -=- 56 pts. (F+3)#,N+2, f+3,1, d/f+1,2,1~b, FLI 1,2 -=- 6 Hits -=- 57 pts.